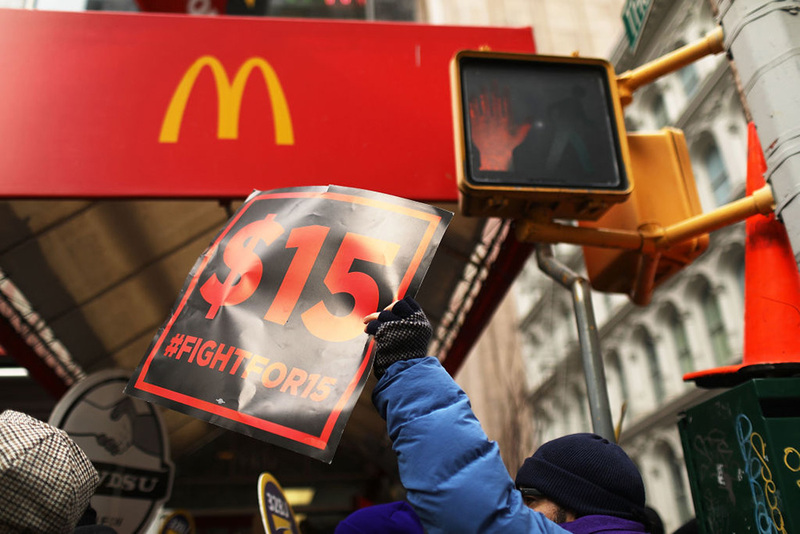 Momentum is building for a possibly massive and destructive minimum wage hike. According to the left-leaning Economic Policy Institute, 27 states have increased their minimum wage since 2014, as have 44 localities. Even liberals who have consistently counseled caution on dramatic minimum wage hikes are starting to change their tune. For example, economist Noah Smith, a columnist for Bloomberg Opinion who has long warned of the dangers of a precipitous hike, recently reversed course and called on Congress to “raise the wage” from $7.25 per hour to $15 per hour. When even market-minded elites like Smith are joining the populist “Fight for $15,” it’s clear that times are changing on the left. If the past is any evidence, they will probably get what they want. One reason for this rising tide of support is a growing body of academic research suggesting that the costs of a minimum wage increase are less severe than critics allege. While the deleterious effects of the minimum wage—from reducing employment to lowering incomes—are well-known, many recent studies argue that it may actually bring previously underappreciated benefits. One published paper suggested that higher minimum wages improved infant health and reduced miscarriage. Another found that higher minimum wages reduce the odds of criminal recidivism, specifically by reducing the odds that former criminals are re-incarcerated for property crimes. Another paper found that regardless of the model specification used, national survey data show a strong positive effect of minimum wages on income and income inequality. The problem, though, is that none of these studies apply to minimum wage hikes as sweeping as those envisioned by the “Fight for $15” campaign. Boosting, say, Alabama’s minimum wage from its current rate of $7.25 per hour to the $15 per hour that wage hike advocates want is certain to create much bigger dislocations than moving Nebraska’s minimum wage from $8 to $9 an hour, as happened in 2016. The only research that sheds light on what a $15 minimum wage would mean is a pair of new papers studying Seattle’s much publicized wage hike from $9 per hour to $15 per hour. The research, published last year by a bipartisan team of researchers organized by Washington’s state government, initially found that the first minimum wage hike from $9 to $11 an hour had no effect on worker incomes, but the hike from $11 to $13 backfired, reducing wages paid in low-wage jobs. A follow-up study published in October found that incomes actually did increase for already-employed and experienced low-wage workers, but that new hiring of low-wage workers plummeted. Overall, this study found that the first, more modest wage hike in Seattle basically had the effect you would expect based on big, national studies of minimum wages, but that the second hike, to $13 an hour, had considerably more negative effects. It is likely that the hike to $15 will be even more damaging. What the evidence is really saying is that modest minimum wage increases do no harm, and probably help some struggling workers. But big wage hikes, on net, start to hurt more than they help. This line of reasoning is more or less confirmed even by fairly conservative economists who have generally been skeptical of minimum wage hikes. A recent paper by David Neumark of the University of California at Irvine, arguably the leading academic skeptic of minimum wage hikes, found that moderately-sized minimum wage increases have no appreciable negative effects on the incomes of people living in poor neighborhoods. He didn’t find a positive effect, but “no harm done” is much better than his previous studies, which have found net losses from minimum wage increases. There simply isn’t any empirically-based academic support anymore, even among free market economists, that modest minimum wage hikes create measurable net losses to the economy. In other words, the Fight for $15 would have very bad economic effects, even if, say, the Fight for $8.50 probably wouldn’t. So where does that leave us? Let’s begin by stipulating that, in an ideal world, minimum wage laws would not be the medium by which we helped out low-income workers. A wage subsidy in which the government deposited supplemental income directly in a worker’s paycheck would accomplish the same ends while causing much less disruption to labor markets, and even encouraging work. That idea, however, has yet to really catch fire in Washington or state capitals. Other programs like the Earned Income Tax Credit come close, but there doesn’t seem to be much excitement for an EITC increase either. So what are lawmakers to do at a time when blanket opposition to minimum wage hikes increasingly looks like a nonstarter? Is there a second-best position that’s responsive to the push for mandated wage increases but appropriately manages the potential economic consequences? The simplest way to thread this needle is to implement a saner version of the increase in a way that is supported by academic evidence. In other words, we should indeed raise the wage, just not to $15 per hour. And probably not to the same level in every place. And probably not adjusted for the Consumer Price Index, a common proposal from minimum wage enthusiasts like Fight for $15 that would lead the minimum wage to steadily grow outside of the control of policymakers. Rather, we should gradually nudge the minimum wage upwards until it reaches a level that is higher than today, but which has been shown to have little or no negative economic effect; say $9 or so. The exact pace of increases is debatable; there is no academic study demonstrating an optimal pace of minimum wage increases to minimize bad effects. But the existing research shows the least-damaging effects for hikes in the $0.25 to $1.00 range. Scheduling in annual hikes would probably amplify effects, as the Seattle study has shown, so it’s good to bias towards a lower end of that range: scheduled increases of $0.25 to $0.50 a year until the wage reaches somewhere around $9 an hour. This would raise wages for many workers, take the fire out of much of the call for a higher minimum wage, and do minimal economic damage. After that, policymakers should neuter the second part of Fight for $15: inflation indexing (i.e. indexing to the Consumer Price Index). Instead of indexing to inflation, minimum wages should be set to track median wages multiplied by the prime-age employment-to-population ratio, which, jointly, is basically a measure of labor demand. This calculation may sound complicated, but it’s valuable. Basically, when the employed share of the working age population falls, say due to a recession, the minimum wage would rise by less, or perhaps even fall slightly, meaning that recessionary firings of low-wage people might be less common. But when wages in a local area are rising, low-wage workers would see their wages rise too. This would not create an inflationary spiral because wages aren’t tied to local prices, but to other local wages. Using median wage instead of average wage ensures that there won’t be a perverse arithmetically driven wage-spiral either. To my knowledge, no country has tried this framework. This proposal would, in the long run, allow local minimum wages to vary widely, preventing low-cost Alabama from being destroyed by a wage set for high-cost California. But it would also ensure that minimum wages grow at a sufficient pace so that workers are less likely to feel that their salaries are constantly being eaten away by inflation: their wage will always be essentially a fixed ratio of what middle-class people in their state are being paid. This indexing, however, is accomplished without tying the wage directly to inflation, so that the minimum wage can respond more dynamically to local market conditions. Furthermore, it’s all phased in at a slow enough rate to minimize the damage from the initial hike. This proposal is clearly a second-best—and, while not ideal, would cause less economic harm than a minimum wage of $15 per hour. In fact, it might actually boost incomes for workers enough to offset the small effects of lower hours or lower employment. But more importantly, it would bake into our system a plan for regional variation in wages and smart indexing, without giving in to the activist demands for a fast-growing, uniform national wage set at Seattle levels. In the long run of course, economists and policymakers should work to replace the minimum wage system with one of wage subsidies. But until then, replacing our current haphazard system with a more systematic, economically-founded, moderate minimum wage law would do much to help workers and stave off economically dangerous activism on the left. Lyman Stone is an economist who specializes in regional development and demographics. He is also an Advisor at Demographic Intelligence, a Senior Contributor at The Federalist, and a Research Fellow at the Institute for Family Studies. He and his wife Ruth currently live in Hong Kong, where they serve as missionaries in the Lutheran Church.